Until now the parts of the single fillers and pigments were only determined by complex and time-consuming combustion methods with different temperatures. 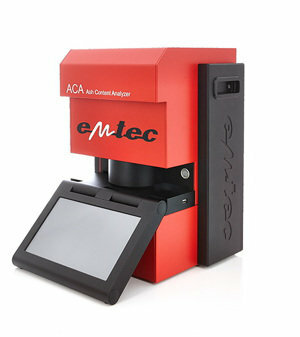 By the use of the emtec ACA Ash Content Analyzer with its really new and innovative measuring procedure the total ash content (fillers and pigments) but also the percentage distribution of the single components can be determined without combustion of the samples. The use of the new measuring device leads to substantial savings in material, time and energy with a simultaneous obvious increase of the measuring accuracy compared to traditional methods in the routine laboratory practices.